Petswelcome.com / Articles / Can You Have Too Many Pets? If you are a true pet lover, the answer to that question would seem obvious: Of course not! There’s no such thing as too many pets. 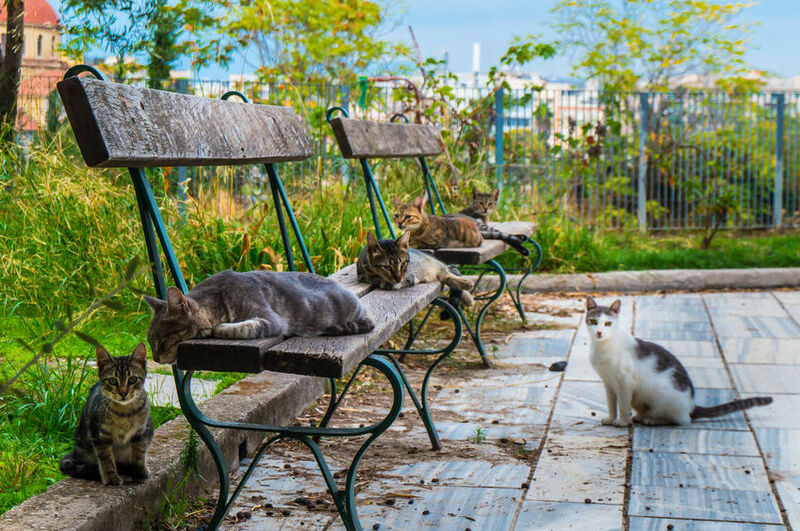 Yes, we all have a person who lives down the street who has twenty-five cats in various states of repose on the front porch, railings, lawn and car, and that does seem a bit extreme. But, in general, my feeling has always been the more pets the merrier. But then I got a call the other day from a very nice man asking me to help him plan a trip he was taking from New Mexico to Florida. “No problem,” I said. I took him to Petswelcome’s Trip Planner so he could choose a route with pet friendly hotels along the way. While I was inputting his departure point and destination, I casually asked him what kind of pet he had. “Nine cats and two large dogs,” he said. We list tens of thousands of pet friendly hotels on Petswelcome but I knew there wouldn’t be any that would allow that many animals. We ended up working out a plan where he could rent a pet friendly RV and, if he still wanted to stop at hotels, leave the majority of the cats in the RV while he and the other animals stayed in a room overnight. How many pets can you afford? While pets aren’t a huge expense, you need to factor in the on-going costs of food and medicines such as heart worm and flea preventives into your monthly budget. And while you can never predict injury or sickness, it’s going to happen—especially as pets age—and you don’t want to become financially strapped when it does. Do you have enough room for them? Pets are like people and need to have a place they can go to be by themselves so they can find peace and a sense of security whenever they get stressed. One happy animal is better than five anxious ones. Also, it’s important that they’re not overflowing out of your yard or living area and becoming a burden to the surrounding community. The last thing you want is a resentful neighbor calling Animal Control and risking the possibility of a fine and/or having your pet picked up in the neighborhood and taken to a local facility. Can you provide the necessary emotional support to all your animals? While that sounds a little precious, let’s face it: animals are emotion vacuum cleaners. They need tons of your love and it’s really important to be able to give each one the time and consideration it needs. I have two dogs and they never stop competing for my attention. One, Rusty, is a Vizsla who dominates over my other dog, Hobbes, so much that sometimes I think that Hobbes feels neglected. The point is that between the two of them, I could not imagine having a third. I wouldn’t be able give it the one-on-one interaction it deserves. Do your pets prevent you from pursuing other things you’d like to do? Those of us who have animals have them because they enhance our lives. And so we often get another (and another) because we want even more of what they have to offer. Sometimes, though, if the limit is exceeded, we can start feeling overwhelmed and resentful at not being able to pursue other things we like to do. For example, if you like entertaining at your house, sometimes having a lot of animals makes that difficult, especially if your friends are averse to pets. If you love traveling, it becomes a huge hassle if you have too many pets to reasonably bring along, forcing you to leave some or all behind which can often incur large boarding fees. Sometimes the joy of owning animals can lull you into a kind of primitive hallucinatory state in which you seem to lose your sense of proportion, looking up one day and seeing twelve cats, five dogs, two potbellied pigs and something resembling a mastodon roaming the savanna of your living room. To that we say, Cool! Kind of. The truth is that responsibility and common sense are called for. I’ve had as many as four pets at a time (two dogs and two cats) and it worked out very nicely. My perfect maximum. Overall, I didn’t have to alter my way of life to a great degree except, perhaps, coming to terms with owning a living room couch that looked like an exploded cotton gin and a lawn resembling a Motocross track. Otherwise, I got the full monty of all the goodness that pets have to offer—companionship, dedication and joy—without regretting that I took a good thing too far.